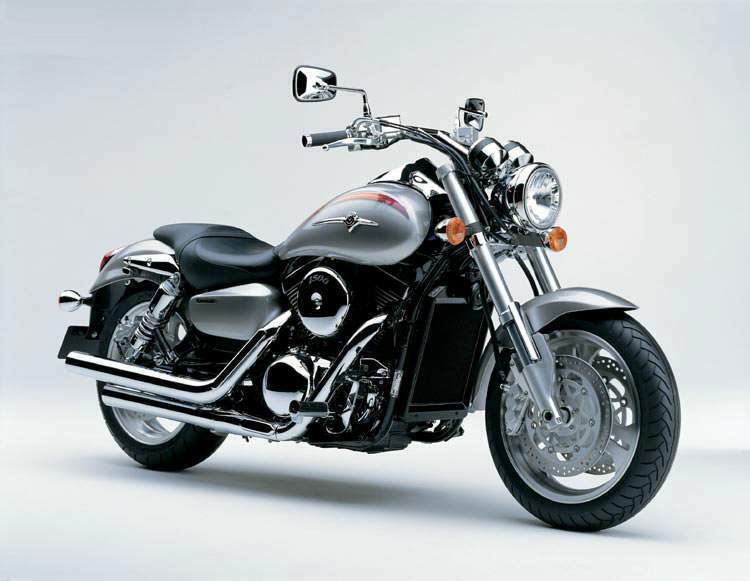 At some stage in every biker should experience riding a cruiser. For the die hard sportsbikes fans this will come as a bit of a culture shock, but for the touring, retro or Streetfighter fans it will be a pleasing experience to ride the type of cruiser now being produced by the likes of Kawasaki. OK I admit that over the years I have actually owned a couple of cruisers, one being the obligatory Harley Davidson (everyone has to have one at some stage in their life! ), and the other was a Honda VFR750 Magna (the one with the 4 pipes and solid rear wheel from the US market) back in 1990, a radical machine for it’s time and not dissimilar to the new wave of drag styled ‘Power Cruisers’ on today’s market. So it was with anticipation and thoughts of the past about bad handling, no brakes, no ground clearance and no power that I parted company with the ZX9R and went off to road test the latest incarnation of the 1500 Vulcan from Kawasaki, the ‘Mean Streak’. My first impressions upon seeing the new Mean Streak were, it’s got upside down forks and ‘BIG’ brakes, the wheels & tyres were 17” and shod with some sticky rubber and it had raked back drag bars, not a typical cruiser at all! This bike is long, really long but it’s also got the lowest seat height on any production bike of this type I have ever ridden, you really felt as if you were sitting in this bike and you became as one when you rode it. The styling of this bike is also something to be considered. The Mean Streak received a resounding thumbs-up from almost everyone who saw it. Kawasaki has pushed the normal cruiser styling to the limit and have taken a drag-bike look and image without going too far. Let’s face it way back in the 80’s Kawasaki came out with a radical bike called the Eliminator. It was in fitted with a 900 motor and later became a 1000. This bike set new standards in customs and was again based on the then drag bike look. 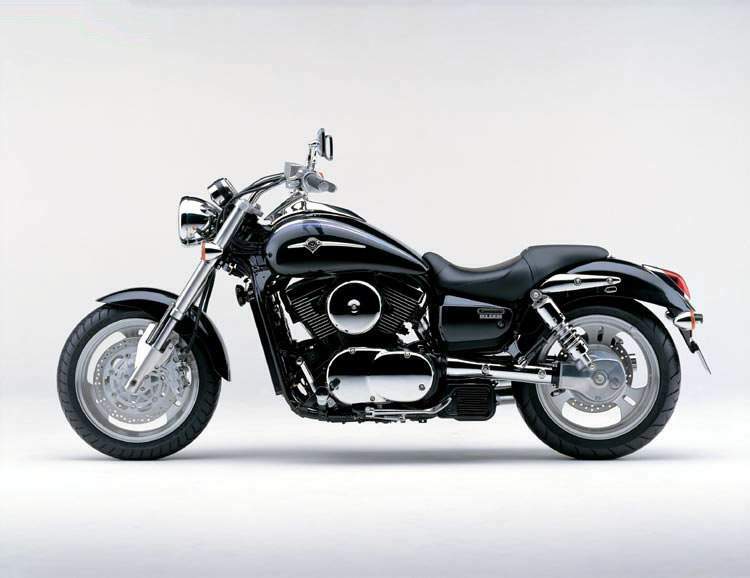 Kawasaki has done it again with the Mean Streak, but this time using a monster V-Twin and not their 4cyl DOHC engines. The overall impression you get of this bike is not the usual laid back cruising style but one of ‘I’m on a mission’. This bike has attitude, it looks mean, it goes well and turns heads, want more reasons for owning one? Well read on! Now with about 66 horsepower at the rear wheel, it doesn’t sound a lot but it’s about 12 more than a std injected Vulcan 1500, Kawasaki have exceeded the 10% increase in performance they set out to achieve. 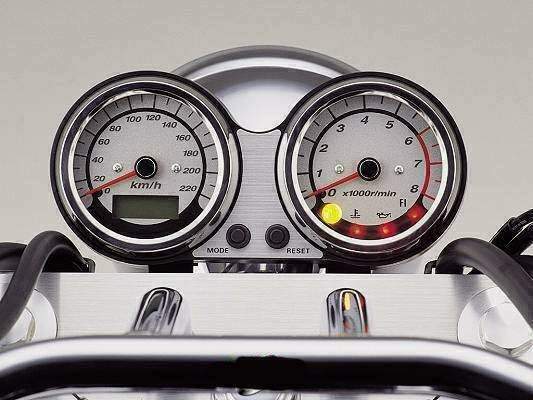 In fact the Mean Streak makes about 20% more than the std Vulcan 1500 and this is directly as a result of the engine mods Kawasaki have done to improve both torque and power. Basically the Mean Streak engine has had quite a few modifications prior to it going on the market. These include new camshafts, larger valves, larger fuel injection throttle bodies, high compression pistons, and re-designed combustion chambers. Add to that a re-designed, close-ratio gearbox and the finished article gives you a bike that accelerates well with a smooth linear power delivery. The Mean Streak really scores well here and it is possibly the best V-Twin performance of any current big bore cruiser with the exception of the VTX1800 from Honda. The eye opener here is definitely in the handling and braking department though. Now considering this bike weighs in at 289kg it feels almost nimble in it’s handling characteristics. It seems to flow through corners with no fuss or straying off line, it didn’t feel at all cumbersome at slow speed and even though it is a feet forward machine there was a reasonable amount of ground clearance. The first things to touch down are the foot pegs and Kawasaki have kindly provided everyone with huge hero blobs on each one. You will definitely use them to their full extent! With the combination of 17” wheels and superbike rubber you can take it round corners at a fair pace but you will have to be prepared to lift your foot and let the pegs rise from the road surface otherwise your precious cowboy boots will definitely look a bit worse for wear after a few trips! The Mean Streak will get up to 110mph with ease in a fairly short space of time (as I found out), not the norm for this type of bike you may say, but at that sort of speed it’s incredibly stable and with the low seating position it’s not too hard on the arms with wind resistance. This makes for pretty rapid cruising not normally associated with a cruiser. The combination of a stiff chassis, large USD forks and good rubber puts the Mean Streak in a different league when you try and compare it to others. When I first collected the new Mean Streak the suspension felt somewhat soft and spongy, but with a quick look at the rear units and the handbook I adjusted the rebound damping - Yes, the shocks have adjustable rebound. The bike was initially set on position 4 but with a little playing around I eventually decided on position 2 giving it a better ride. After making this simple adjustment the suspension felt much better, not soft by any means, yet stiffer than most other cruisers. I felt that the new setting was much more at home for the bike given its somewhat sporty nature for a cruiser! The rear shock can also be adjusted for ride height by means of air volume. By adding air you effectively increase compression damping (or decrease by lowering it) and you can therefore raise the rear ride height to increase steering quickness and the somewhat low ground clearance the bike has in standard trim. The entire package from the styling to the handling, the power delivery and braking performance, the Mean Streak is about being different. 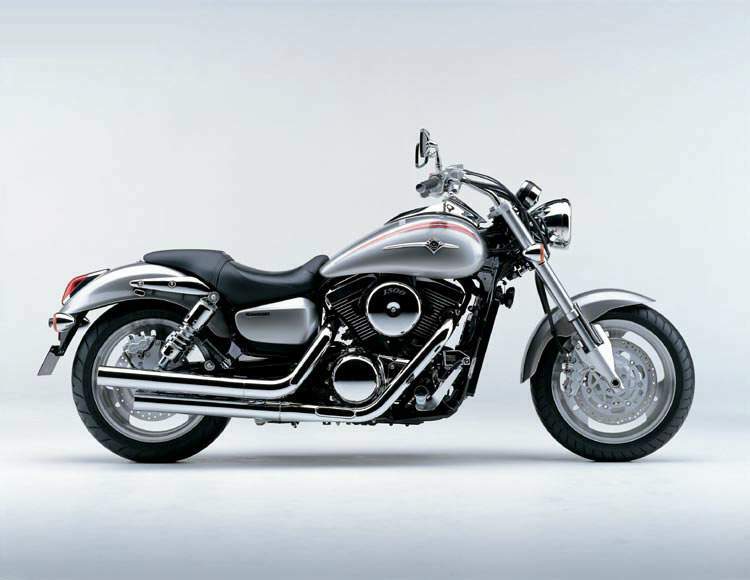 Kawasaki have changed the way cruisers are perceived and substantially raised the general performance level of your average, somewhat boring big-bore V-twin cruiser. The bike is just plain fun to ride, its comfortable ‘Oh-so-low’ seat height and those Drag bars just go hand-in-hand with this bike. It does look mean, its well built and very well finished and it also goes round corners well, and that’s an all-important part of this type of new breed sports cruiser. Oh, and the brakes, what more can I say than ‘Wow’ they work!Initially I found myself needing to use a fairly firm pressure on the forward mounted gearchange to get smooth shifts up the box but this I’m sure was just a bit of laziness on my part. The general relaxed attitude the Mean Streak gives you whilst riding it is surely to blame! (Or so I keep telling myself) I did get it right after a little whilst practicing the despatch of all other traffic from the lights, and boy does this bike leave the lights with authority! Although not having ridden one yet I suspect that the VTX 1800 from Honda will be the bike to take this crown.So the bottom line is this, If you like the styling of the Mean Streak, you’ll love this bike. It does everything well and has that one element you just can’t build into a bike - character.